Designed for artists, the Princeton Select line of brushes goes beyond the basic brush shapes and sizes that make up the artist's arsenal. 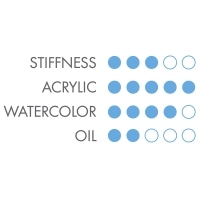 Joining a range of high-quality Rounds, Filberts, Flats, Chisel Blenders, Liners, and more are exciting technique brushes that include Lunar Blenders and Filbert Grainers. True to the Princeton tradition, every Princeton Select brush is handcrafted and tested to ensure beautifully consistent performance. Princeton Select brushes are short-handled. Natural Bristle Bright — The Princeton Series 3750 Bristle Bright Brush is a stiff bristle brush that is ideal for covering large surface areas and creating textured uncoats. This brush spreads medium-bodied to heavy-bodied paint smoothly and evenly. The short, balanced handle allows for comfort and control while covering large areas. Natural Bristle Bright, Size 1-1/2"